THIS YEARLING COLT IS BY THE GROUP 1 & 2 WINNING STALLION "MASTER OF DESIGN"
THE COLT IS THE FIRST FOAL FROM THE SEBRING MARE "SEBRING SPIRIT"
HE IS CORRECT AND WELL GROWN. MASTER OF DESIGN (AUS) (Bay or Brown 2005-Stud 2012). 7 wins to 1300m, ATC TJ Smith S., Gr.1. Sire of 124 rnrs, 68 wnrs, inc. SP Miss Wahoo, The Mitigator, Creative Genius, Creativity, Kinetic Design and of Bennelong Dancer, Jaminzah, Grand Design, Greyworm, Lakeshore Eagle, Port Vale, Cranbrook, Knight Commander, Party Planner, Senor Gaudi, Star of Patch, Swiss Design, Vin Fiz, Deal Master, Gucci Guccimo, Incision, Masterati, Designer Maid, etc. SEBRING SPIRIT, by Sebring. Unraced. This is her first foal. STANZA SPIRIT, by Invincible Spirit (Ire). 2 wins at 1000m, 1200m, 2d MVRC Super Elegant H. Dam of 2 named foals, neither raced. Little Boy Blue. 5 wins from 1400m to 1600m, A$144,797, MVRC Absolute Office Centre H., Tatts Group H., Alternate Railway Safeworking Pty Ltd H., 2d VRC Puramaka H., MRC Betfair H., 3d MRC Ahern's at Highways After the Last H.
Stanz the Man. 4 wins to 1400m, A$91,840, WATC 96FM Perth's Best Music H., La Belle Russe H., Paragon of Virtue H., 3d WATC Komatsu Dash 5 Loader H.
Hot Footing. 2 wins at 1200m, 2000m, BTC Reward Insurance H., 3d QTC Thurlow 2YO H.
Heart of Light. 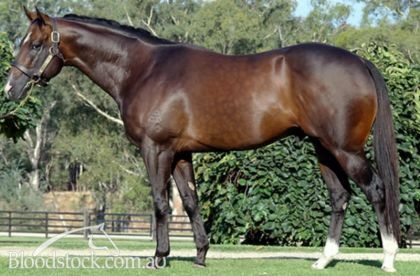 9 wins-1 at 2-from 1200m to 1900m, A$93,200, 3d BTC Brisbane247.com.au H., Capital Finance H.
Stanza Spirit. 2 wins. See above. Blue All Over. 2 wins at 800m, 1350m in Aust. Surge. Winner at 1050m in Aust. Decent Master. Winner at 1400m in Macau. Kartem Over. Winner at 1600m in Aust. Picablu (c Piccolo) 14 wins from 900m to 1600m, A$392,739, BTC Northern City Finance H., QTC Ormiston College H., Mighty Grey Welter H., BTC Toll QRX H., Lasers Disco Hire H., QTC Winning Edge Presentations H., 2d BTC Traveltrain Holidays H., James Brockhurst The Good Guys H., QTC Padua College H., JHS Barnes H., City News H., 3d Qld Tatt's RC Recognition S., L, 4th BTC Summer S., Gr.3. Rocking the Blues. 5 wins-2 at 2-to 1400m, A$184,015, WATC Westspeed 2YO H., Perthracing.com.au H., Playeronline.com.au H., Nigel Blotton H., 2d WATC Crying Game 2YO H., Become Perth Racing Member H., Cardinal Virtue Sprint H., Perth Racing H., Westspeed 2YO H., 3d WATC William & Hughes Peel Thunder FC H., Carlton Dry Fusion H.
MEMPHIS BLUES (f Semipalatinsk) 10 wins. See above. SUBSCRIBE - VENGEANCE OF RAIN (H.K.) (g Zabeel) Horse of the Year in Hong Kong in 2006-07. Champion Stayer in Hong Kong 2004-05 & 2006-07 & in UAE in 2006-07. 10 wins-1 at 2-from 1200m to 2400m, A$64,000, HK$46,965,500, 11,040,000Dhs in Aust., HK and U.A.E, HKJC Audemars Piguet Queen Elizabeth II Cup, Gr.1, Cathay Pacific Hong Kong Cup, Gr.1, Nad al Sheba Dubai Sheema Classic S., Gr.1, MRC Chairman's S., L, HKJC Cathay Pacific International Cup Trial, L, Centenary Vase, L, Mercedes-Benz Hong Kong Derby, L, Hong Kong Gold Cup, L, Hong Kong Champions & Chater Cup, L, 2d HKJC Audemars Piguet Queen Elizabeth II Cup, Gr.1, Hong Kong Champions & Chater Cup, L, 3d Cathay Pacific Hong Kong Cup, Gr.1. PINOT (f Pierro) 3 wins from 1800m to 2500m, A$733,275, in 2017-18, VRC Oaks, Gr.1, MRC Ethereal S., Gr.3, VRC Kennedy Oaks Trial P.
DIZLAGO (f Encosta de Lago) 2 wins-1 at 2-at 1400m, 2000m, A$85,163, MRC Ethereal S., L, Shoobra 2YO P. Producer. OLD NORTH (g Lonhro) 4 wins from 1350m to 2000m, A$316,990, to 2017-18, ATC Tulloch S., Gr.2, BRC Makers Mark H., ATC All Too Hard at Vinery P., Cafe Culture & Insitu H., 2d ATC Frank Packer P., Gr.3, 4th ATC Shannon S., Gr.2, Phar Lap S., Gr.2, GCTC AD Hollindale S., Gr.2. CABLE - WELL DONE (Mac.) (g Last Tycoon) 8 wins-2 at 2-at 1000m, 1200m, A$93,540, M$1,666,550 in Aust. and Macau, SAJC Jansz S., Gr.3, VATC Highways Tabaret H., 2d VATC Out of Danger 2YO H., Macau Airdrieonians H.
PLATINUM COMMAND (f Red Giant) 10 wins from 1400m to 1800m, NZ$311,842, to 2018-19, CJC Winter Cup, Gr.3, WRC Whyte H., 2d CJC Winter Cup, Gr.3, Marton JC Metric Mile, Gr.3. EVASION (f Semipalatinsk) 6 wins-2 at 2-from 1200m to 3200m, A$105,260, Queensland Cup, L, BATC Neighbours Rest S.H., QTC Denmac Louisville H., 3d BATC Labour Day Cup, L.
Bluetinsk (g Semipalatinsk) 7 wins from 1200m to 2100m, A$75,370, TRC Charlie Goggin H., 3d TTC Launceston Cup, Gr.3, Tasmanian St Leger, L.
Russian Trader (c Semipalatinsk) 4 wins-1 at 2-from 1000m to 2000m, A$78,790, VRC Great Western H., BTC AIW 5 Star H., 3d VRC St Leger, Gr.3. KINGS HONOR - BON AMIE (Sing.) (g Fairy King) 7 wins from 1200m to 1800m, NZ$32,500, S$730,513, Singapore TC Patrons' Bowl, L, 3d Wellington Guineas, Gr.2.